Doug is the Associate National Map Liaison for New York. He is also a member of the NGP Water Resources Community of Use. I began my career as an environmental scientist for a southern New Jersey engineering firm. I then worked for Computer Sciences Corporation as an on-site contractor to the U.S. EPA Region III Office in Philadelphia providing database management, programming and GIS support. In 1992, I joined the USGS NY Water Science Center as a geospatial technology specialist and since 2011 my duties include NY National Map Liaison responsibilities. I earned a Bachelor degree in geology from Lafayette College and hold a Master of Science in Computer and Information Sciences with an emphasis on computer graphics from Temple University. I provide geospatial project support and application development for multidisciplinary science programs focused on ecosystems and environmental health, climate and land use changes, water, and hazard science. Geospatial expertise is provided using the latest available spatial datasets and software to analyze and present scientific data needed by researchers and water managers. I support a watershed approach to characterize the natural and anthropogenic features that define the environmental setting, an essential component of groundwater, surface water and ecological investigations. This characterization includes the use of lidar data for terrain analysis of drainage basins and groundwater water study areas. I produce digital cartographic products for geographic data presentation in figures and map plates included in published reports. Freehafer, D.A. and Passy, S.I., GIS at a microscophic level -- Effect of streamflow variability on the morphological complexity in diatom colonies, Northeast ARC Users Group Conference, Pittsburgh, Pa, May 28-June 1, 2002. 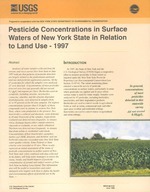 Phillips, P.J., Eckhardt, D.A.V., Freehafer, D.A., Wall, G.R., and Ingleston, H.H., Regional patterns of pesticide concentrations in surface waters of New York in 1997, Journal of the American Water Resources Association, June 2002, v. 38, no. 3, p. 731-745. Passy, S.I. and Freehafer, D.A., Current variability shapes morphological complexity in colonial stream diatoms, Phycological Society of America, 55th annual meeting, June 23-28, 2001, Estes Park, Colorado, Abstract number 102, p. 37-38. Freehafer, D., 1992, Delineation of drainage basins in a large watershed from digital elevation model data [abs. ], NEARC (Northeast ARC/INFO Users Group Conference), 7th Annual, Oct. 19-21, 1992, Stamford, Conn., unpaginated. Hughes, T.H., Bloss, P., Fambrough, R., Stow, S.H., Hooks, W.G., Freehafer, D.A., Sutley, D., 1976, Delineation of geologic problems for use in urban planning: final report for the National Aeronautics Space Administration, (contract NAS8-29937) Research Project, 75 p.
Lumia, Richard; Freehafer, Douglas A.; Smith, Martyn J. 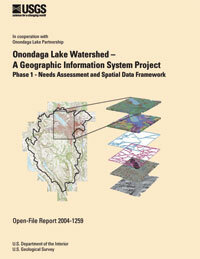 Magnitude and Frequency of Floods in New York; 2006; SIR; 2006-5112; Lumia, Richard; Freehafer, Douglas A.; Smith, Martyn J.
Freehafer, D.A., and Pierson, Oliver, 2004, Onondaga Lake Watershed–A Geographic Information System Project Phase I – Needs Assessment and Spatial Data Framework: U.S. Geological Survey Open-File Report 2004–1259, 79 p., https://pubs.er.usgs.gov/publication/ofr20041259.